R, R language, R environment, statistical software, data mining, predictive analytics, epidemiology, biostatistics, analytictive statistics, parametric and nonparametric statistical methods, charts and data transforms you will need for analyzing and presenting data. VisualStat is a comprehensive and versatile desktop statistics package that is simple for beginners, yet powerful enough for experts. It is designed for business, science, marketing, and education, with fully functional spreadsheet. It incorporates all the descriptive statistics, parametric and nonparametric statistical methods, charts and data transforms you will need for processing, analyzing and presenting data. Multivariate procedures are included e.g. Principal component analysis and Agglomerative Hierarchical Clustering. All test results have an associated report which provides a short conclusion and other descriptions to assist in the interpretation. VisualStat is a major integrated development environment for R, allowing users to run R scripts and commands directly inside VisualStat. R output can be retrieved as native VisualStat output, and managed via highly flexible VisualStat containers. 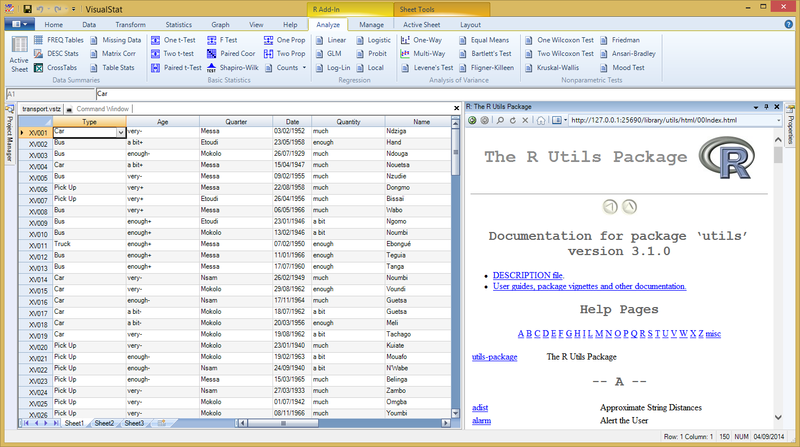 All VisualStat DataBook are manipulated as the R DataFrame, without any import/export procedure. Provides a platform-independent basic-statistics GUI (graphical user interface) for R, based on the many package. Chart types in VisualStat include all the usual types for statistical data such as Bar, Pie, Line, HiLo, Candle, Polar, Error Bar Plot, Interval Plot and Box-and-Whisker Plot charts together with 3D charting options. A wide variety of action is available including Zoom, Rotate, Scale and Translate Chart. VisualStat DataChart can be exported in many formats, including *.jpg , *.bmp, *.emf and *.png file formats. VisualStat has a well-designed user interface with all its statistical and charting procedures easily selected from ribbon. Basic and frequently used commands can be shown continuously for instant access. With VisualStat DataBook, you can develop feature-rich database with an object-oriented, extensible set of classes to incorporate spreadsheet functionality into your set of data. VisualStat supports ODBC database connections. Minor fixes. Various errors on French localization. A blank cell causes an error on an unauthorized modality. TabStop reorganized. The licensed version now displays the user name. On first use, the log information show an error.